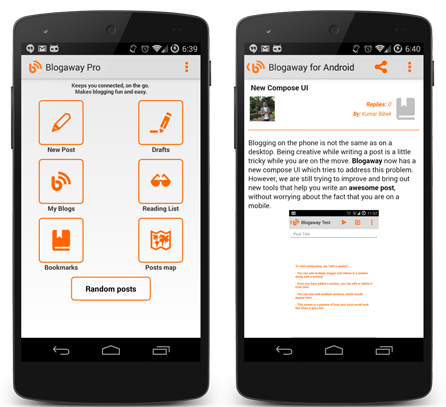 Blogaway for Android is your blogging companion while you are away from your desktop. Keeps you connected, on the go. A simple blogging client for your Android phones. Makes blogging fun and easy. Keeps you connected, on the Go. With Blogaway for Android, you can publish to your blog in seconds. Write a few words, attach photos and videos from your phone, and Blogaway does the rest. Blogging has never been easier. The free version has all the functionalities and features as compared to the Pro version, and in the future. The ads are not very disturbing, but might be a little irritating. No ads. Only $2.49. Keep blogging at ease from your Android phones.